The village of Appenzell is the capital of the canton Appenzell Innerrhoden in eastern Switzerland. It is situated in the valley of Sitter, surrounded by green hills and dominated by a rural character. Appenzell isn’t a typical close-packed village and instead, is made up of free standing houses loosely grouped around the inner core. The parish church with the Gothic choir and massive tower rises over other stately homes such as the city hall, monasteries and other historical buildings. Hotels, cafés, traditional craft shops and stores located in brightly painted houses line the car-free main street. Especially impressive is the facade of the Löwen, which is painted with a huge variety of medicinal herbs. Just like the town houses, even the farm houses and adjoining barns in the region are known for being extremely colorful, often having bright yellow walls, red doors and green shutters. This tradition goes back centuries, when wealth was shown by being able to afford paint for ones facades. 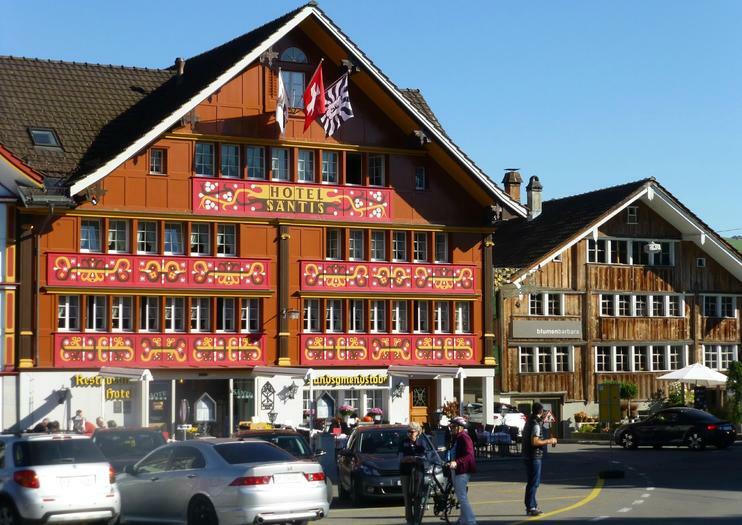 Tradition and customs are held in high esteem in Appenzell and apart from many cultural events, Appenzell is especially worth a visit during the yearly alpine ascent and descent of cattle. At the beginning of spring and at the end of summer, farmers don colorful traditional garb and lead their cattle either up the mountains to the lush alpine pastures or back down into the valley. The ceremonial processions are a festive occasion and many people from near and far line the streets to watch the decorated farmers and cows, hear the singing and listen to the melodious clang of the heavy bells. Appenzell is located in eastern Switzerland and can be reached by train from Zürich in just under two hours. A change of trains to the S23 is necessary in Gossau. From St. Gallen, the journey takes roughly 45 minutes.